The present church, which seats about 140 people, was built alongside Ossington Hall by Robert Denison as a memorial to his brother William, merchant, banker and landowner, who died in 1782. In a woodland setting away from the village, it stands on the site of an earlier church, dating back to the twelfth century when the manor of Ossington was given first to the abbey of Lenton and then to the Knights of the Hospital of St John. Some memorials from this first church are preserved in the present one, which still retains its character as an estate church. But the rebuilding to plans of John Carr of York was so thorough that no other traces of the previous building remain. 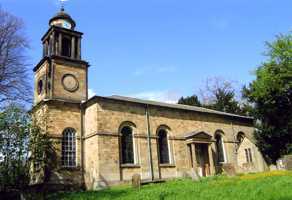 The church has a classically simple Georgian rectangular form, with an attached western tower crowned by a dome. Beyond the present east-end there was originally an even more grandiose domed octagonal mausoleum for the Denison family. The mausoleum was demolished in 1838, though a vault survives containing the bodies of 13 members of the Denison family. The church is in excellent condition and contains many interesting monuments and statues, together with some impressive late 19th and 20th Century stained glass windows. The most striking is that by George Cooper Abbs. There is a rare palimpsest brass on a box tomb dedicated to Reginald Peckham (d1551) and his wife, Frances Cartwright, whose family acquired Ossington at the Reformation. Several other Cartwright memorials survive including an impressive early 17th Century tomb. There are two organs: a Victorian positive organ and, in the lower storey of the tower, a barrel organ of 1836. The redundant graveyard contains some tombs predating the rebuilding. The new graveyard, was formerly the rose garden of Ossington Hall.